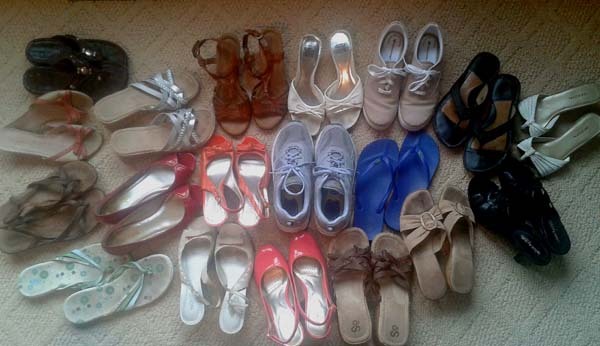 It’s time to unpack the summer shoes! Well, for those of us in the Midwest, we might unpack them, but we probably won’t wear them for another month. But that’s OK; it gives us time to ease into them. You see, Midwest winters are so long that our feet forget what it’s like to wear sandals. We can’t just jump into our strappy shoes and wear them all day – we’d get blisters – and that isn’t pretty or fun! So we gradually condition our feet. We wear our summer shoes as temperatures allow, but just until they start to rub, and then we take them off. Tomorrow, if it’s warm, we’ll repeat and extend the wear time a little bit. If we do this correctly, by the time summer’s here, we’ll have rebuilt the calluses, and we’ll be able to comfortably wear our cute shoes all day every day! We build calluses on our heart the same way! When we disobey, or ignore God, the Holy Spirit convicts us of sin. It’s as if the Holy Spirit rubs against our hearts the same way our flip flops rub against our toes. It’s just a minor irritation at first, but in that moment we have a choice: we can stop the behavior that brings spiritual irritation/conviction, or we can choose to ignore the warning sign. If we don’t heed the warning, then the next time we disobey, or ignore God, the rubbing is not as uncomfortable. And by the third or fourth time, we have a good solid callus and don’t feel a thing. Whew! Now we can sin in comfort! The only way one can wear sin comfortably is to have a thick callus on the heart: a hard heart. But that’s not what God wants for us. Disobedience: going your own way. Taking God’s blessings for granted: thinking you deserve God’s favor and the gifts He gives. Discontentment: blaming God for your unhappiness. Not appreciating what He has given: wanting what you don’t have instead of appreciating what you do have. Rejecting God’s discipline, allowing the consequences of your sin to push you away from God instead of draw you closer. Not applying what you learn: not letting God’s Word change your life. If you have developed a calloused heart, you don’t have to stay that way. You can change! Do you recognize the warning signs of developing a hard heart? Is there an area where the Holy Spirit is convicting you? Will you humbly bow before God, and choose God’s will; surrender your pride and power, and let God continue to soften your heart. One toe at a time into the warm water.